The garment known today as kanga or leso provides a practical, attractive, comfortable form of dress for a tropical climate. It is also an ancient form of communication: it carries a message. 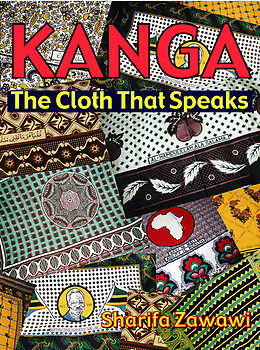 The sayings that appear on kangas reflect Swahili cultural and human values, material and verbal art; they maintain Swahili literary traditions and enrich them; they present a composite of the historic mercantile connection of items of clothing within the wide context of the Indian Ocean. Sharifa Zawawi's search for a better understanding of kangas led her to examine the history of the kanga, its design, message and significance for Swahili speaking communities within the modern nations of East Africa and the Gulf states. In this unique coffee-table style book with a 14 page full color section in art paper, she illustrates and discusses kangas and their messages from Dar es Salaam, Mombasa, Zanzibar and Muscat. Dr. Zawawi takes into account the complexity of kanga history and begins to trace anew the development of kanga from cloth to clothing. Kanga inscriptions provide a documentary representation of Swahili social and political forms of discourse. They express the traditional socio-cultural values of the Swahili community while also reflecting the advent of modernity and change. They are an important source for understanding Swahili ideal behavior and the Swahili value system; their content relates to both women and men, young and old. They instruct at the same time that they provide an outlet for emotions and expectations. They are a window to changing values and cultural and political attitudes. The messages printed on the cloth are permanent - yet of their time. Culture, history, fashion and language are inextricably interwoven in this study of East African dress. Sharifa Zawawi is Professor Emeritus of Classical Languages. She has taught Linguistics, Arabic, Swahili and Middle Eastern Languages and Cultures at The City College of the City University of New York (CUNY), Columbia University and the New York University. She has worked as a language consultant and examiner for several universities in the US. She is the author of Kiswahili Kwa Kitendo, Say it in Swahili, Loan words and their Effect on the Classification of Swahili Nominals and Fast-Track Swahili. With Africa World Press, she has published Kiswahili Kwa Kitendo Vol. I (1980), Learn our Kiswahili Vol. II: Jifunze Kiswahili Chetu (1993), Converse in Kiswahili: Ongea (1991), What's in a Name? Unaitwaje - A Swahili Book of Names (1993) and African Muslim Names: Images and Identities (1998).